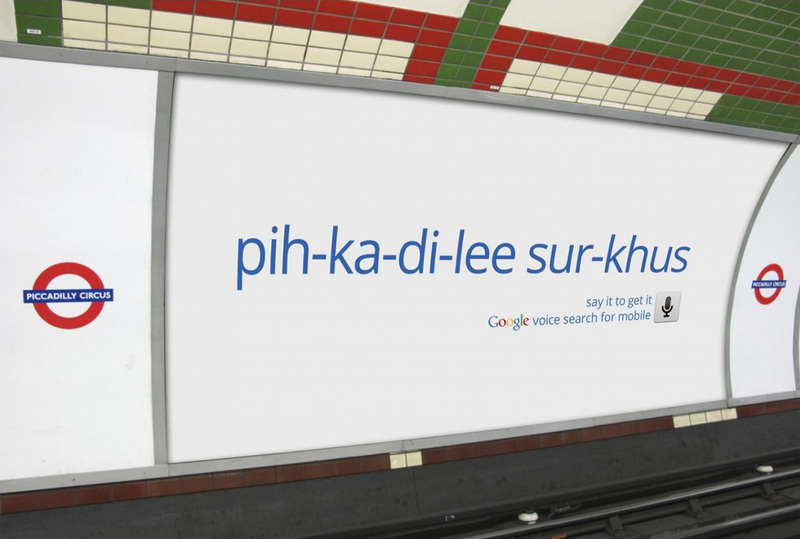 CANNES, France—An endearingly quirky billboard campaign for Google Voice Search, featuring more than 150 site-specific ads with phonetic spellings of nearby landmarks, has earned London agency Manning Gottlieb OMD the Grand Prix in Media at this year's Cannes Lions festival here. Creative agency BBH in London came up with the idea for the phonetic ads—perfect for a product that allows you to speak your search queries instead of typing them. But it was Manning Gottlieb OMD that really turned the campaign into a triumph. The agency researched the neighborhoods where the billboards would appear and created a "hyper-contextual database" of everything interesting near each site. This database became the creative brief for BBH, which then churned out more than 150 site-specific creative executions across 10 formats. A total of 107 Media Lions were awarded tonight. U.S. agencies won 12 Lions overall, including one gold, which went to MediaCom in New York for its "Project Imagin8ion" campaign for Canon.